What is a USB Connection Port? Universal Serial Bus is an interface standard for connecting peripheral devices to computers. Hardware components for implementing a USB interface include connector ports on computers and cables for connecting peripheral devices to the computer. 1. The USB standard supports data transfer rates of 12 Mbps. 2. A single USB port can be used to connect up to 127 peripheral devices. 3. 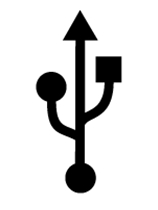 USB is designed to standardize the connection of computer peripherals, such as keyboards, pointing devices, digital cameras, printers, portable media players, disk drives and network adapters to personal computers, both to communicate and to supply electric power. 4. It has become common place on other devices, such as smartphones, PDAs and video game consoles. 5. USB has effectively replaced a variety of earlier interfaces, such as serial and parallel ports, as well as separate power chargers for portable devices. How to adjust bass on your Samsung SMART TV? How to check the Camera & Mic in SMART TV?